Ink drawings have a very long artistic tradition. This has always been an interesting medium for artists and graphic artists, it lends drawings expression and durability and can also be combined with many other drawing techniques. Faber-Castell has combined all the advantages of artist’s inks with the benefits of a modern, easy-to-use disposable pen – the PITT artist pen. The pigmented and very lightfast drawing ink is ideal for sketches, drawings, layouts, fashion design and illustration. Pigmented drawing ink – High light resistance – Waterproof, permanent – Odour-free, acid-free, pH neutral – Brush tip An excellent choice for adult colouring, Faber-Castell PITT® artist pens are filled with high quality India ink. As a blendable, acid-free, lightfast pen, PIT [read more]. 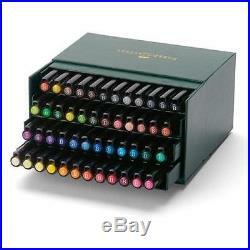 Faber-Castell Indian Ink PITT Artist Pens – 48 Box #167148. Odour-free, acid-free, pH neutral. An excellent choice for adult colouring, Faber-Castell PITT® artist pens are filled with high quality India ink. As a blendable, acid-free, lightfast pen, PITT® artist pens are perfect for colourists who prefer the versatility of a modern pen with traditional ink. These pens are perfect for colouring because the ink does not bleed. The pens can be used in combination with the Faber-Castell Albrecht Dürer artists’ watercolour pencils and Polychromos pencils. Includes: ivory (103), light yellow glaze (104), cadmium yellow (107), dark camium yellow (108), dark chrome yellow (109), phtalo blue (110), leaf green (112), orange glaze (113), light skin (114), medium skin (116), scarlet red (118), ultramarine (120), pale geranium lake (121), middle purple pink (125), pink carmine 127, pink madder lake (129), light flesh (132), magenta (133), crimson (134), purple violet (136), cobalt blue (143), sky blue (146), ice blue (148), cobalt turquoise (153), light cobalt turquoise (154), cobalt green (156), dark indigo (157), phtalo green (161), light phtalo green (162), permanent green olive (167), caput mortuum (169), may green (170), chromium green opaque (174), dark sepia (175), raw umber (180), Indian red (192), black (199), light indigo (220), cold grey I (230), cold grey III (232), cold grey VI (235), lilac (239), indianthrene blue (247), dark phtalo green (264), green gold (268), warm grey I (270), warm grey III (272), warm grey IV (273). Craft Fabrics & Sewing. Die Cutting & Papercraft Tools. Embroidery & Cross Stitch. Flowers, Stamens & Leaves. Masks, Stencils & Templates. Ribbons, Lace & Trimmings. Stamps & Stamping Inks. Wood & Other Craft Blanks. Hobby & Crafting Fun. 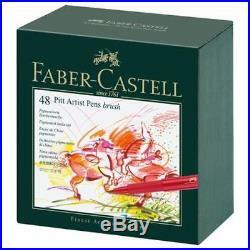 The item “Faber-Castell Indian Ink PITT Artist Pens 48 Box #167148″ is in sale since Saturday, June 25, 2016. This item is in the category “Crafts\Art Supplies\Drawing & Lettering Supplies\Art Pens & Markers”. The seller is “cuddly_buddly” and is located in Spalding. This item can be shipped worldwide.